Listing also called output is the list of directories and files and their attributes enumerated one after another in separate lines. You can select directories you want to list by clicking on white box on the left side of a directory name. The given directory will be selected with or without all of its subdirectories depending on the status of 'Select with subdirectories' option. You can override this setting by pressing SHIFT to select a directory with all subdirectories, or CTRL key to select only one directory. (Checked white box) - list this directory and all subdirectories recursively. When you save a directories selection file only this directory is stored there without its subdirectories. This enables using the same selection file even if new subdirectories are added or deleted from the selected directory. (Checked grey box) - list this directory but not all of its subdirectories (not all could also be none). This directory will be stored in a selection file. (Grey box) - list some of the subdirectories of this directory. This directory is not stored in a selection file. (White box) - do not list this directory and none of its subdirectories. This directory is not stored in a selection file. You can see how the listing will look like in this window. You have an option to copy the contents of the preview window to a clipboard by pressing the Copy button in the Edit menu. Preview window can be automatically refreshed each time you select/deselect a directory or change any option if appropriate option is selected on Program options page. Save listing... - Generate and save listing under a specified name. Print listing... - Generate and print listing. Send listing... - Generate and send listing as e-mail attachment. Load configuration - Load a previously saved configuration file. Save configuration - Save the current configuration file to a file. Save configuration as... - Save the current settings to a configuration file for later use. Quick configuration - Quickly load a configuration file that is saved in the Application Data folder or in the installation folder. You can manually create subfolders in the Application Data folder and this structure will be reflected in the Quick configuration menu. The Application Data folder is "%APPDATA%\KRKsoft\Directory Lister Pro\". Save as quick configuration - Save a configuration file to the Application Data for later use from Windows Explorer context menu and from the Quick configuration menu. Load HTML style - Load HTML style configuration from a .dlh file. Save HTML style - Save HTML style configuration into a .dlh file. Quick HTML style - Load one of the HTML style configurations saved in the Application Data folder or in the installation folder. Save as quick HTML style - Save a HTML configuration file in the Application Data folder. You can manually create subfolders to store these configurations there. Load directories selection - Load a previously saved selection file. Save directories selection - Save a selection file for later use. Print preview - Preview how the listing will look when printed. Page setup - Setup the page configuration. Cancel - Cancel listing generation. Exit - Exit from the application. The Language menu displays all available languages for user interface. The selected language is immediately applied to the interface. Copy - Copy the contents of the preview window listing to a clipboard. If you select a portion of a listing, only that portion is copied to a clipboard. Split - Set focus to the split bar so you can resize windows. Refresh listing - Generate and show listing. Refresh directories - Clear directory tree and current directory selection and read its contents again. Help Topics - Show an index to topics on which you can get help. Contact support - Send e-mail to support team. Visit homepage - Go to http://www.krksoft.com. Check for updates - Force checking if a newer version of Directory Lister is available. Program can automatically check for updates every 30 days if appropriate option is set on Program options page. About Directory Lister... - Show the 'About' window where you can find registration data and the current version number. Save listing - Generate and save listing under a specified name. Print listing - Generate and print listing. Send listing - Generate and send listing as an e-mail attachment. Copy - Copy the contents of the preview window listing to a clipboard. If you select a portion of a listing, only that portion is copied to a clipboard, otherwise the whole listing is copied. Refresh listing - Generate and show listing. The preview window can be automatically refreshed after any option is changed if appropriate option is set on Program options page. Cancel - Cancel listing generation. This option is only enabled during listing generation. Help Topics - Show the program help. Purchase features - Purchase Directory Lister license (standard installer) or selected features (Windows Store edition). Exit - Exit the application. This page allows you to select standard file properties that will be presented on the listing. There is a variety of different properties you can list. The edit boxes with a spin control to the right of some columns determine the width of particular column in the text listing unless Auto column widths option is selected. Number - Count and display the numbers in front of each file. Path - Include full path in front of each listing item. After selecting this option, choose what part of the path will be actually displayed using Path option on Format & sorting page. Name - Display file or directory name. This option cannot be unchecked. Extension - Display file extension. Directories are assumed to have no extension (that is '.' is not perceived as extension determinant). Type - Display type as registered in Windows Registry. Size - Display size for files and total size for directories. Total files count - Display total files count for a directory and all its subdirectories. Creation date, Last write date, Last access date - Display proper date for a file. Attributes - Display one of possible attributes: read-only, archived, hidden, system, compressed. Owner - Display the user who is the owner of the file. Drive volume label - Display drive volume name on which the file is stored. This page allows you to display properties of document files. These are usually Microsoft Office documents (.doc, .docx, .xls, .xlsx, .ppt, .pptx extensions), Open Document Format documents (.odt, .ods, .odp, .odg, .odf), e-books (.epub, .fb2, .fb2.zip) PDF files and also some other file types (eg. .tif files). These properties can be changed in Windows Explorer when you right click on a file, select Properties menu item and then switch to Details page. Such properties can also be stored in the NTFS file system which is used on Windows XP, Vista, 7, 8 and 10 operating systems. To see these properties, please select Display NTFS compound properties option on Behavior page. AutoCAD DWG properties are displayed as document properties only if DWG Columns for Explorer (32-bit) from JTB World is installed on a PC. This also works on Vista++. See Extensions for all supported file formats. These columns extract available media information from image (like .bmp, .gif, .jpg, .png, .tif), video (.avi, .wmv, .mpg, .mkv, .divx, .mp4, .mts, .m2ts .flv, .mxf) and music (.mp3, .wma, .mid, .wav, .mka, .flac) files. The Bits per pixel property is represented per channel for video files (eg. 8 or 10 bits) and for all channels or palette size for image files (eg. 24 or 32 bits). These columns extract executable information from .exe, .dll, .ax, .cpl, .ocx, .sys etc. files. CRC32 - Count and display Cyclic Redundancy Check sum using CRC-32-MPEG2 / CRC-32-IEEE 802.3 standard. This produces 8 digit hexadecimal number which is consistent with crc32 value used in zip/rar archives. MD5 - Count and display Message-Digest algorithm 5 hash value presented as 32 digit hexadecimal number. SHA-1 - Count and display Secure Hash Algorithm 1 hash value presented as 40 digit hexadecimal number. SHA2-256 - Count and display Secure Hash Algorithm 2 256 hash value presented as 64 digit hexadecimal number. SHA2-512 - Count and display Secure Hash Algorithm 2 512 hash value presented as 128 digit hexadecimal number. SHA3-256 - Count and display Secure Hash Algorithm 3 256 hash value presented as 64 digit hexadecimal number. SHA3-512 - Count and display Secure Hash Algorithm 3 512 hash value presented as 128 digit hexadecimal number. Whirlpool - Count and display Whirlpool hash value presented as 128 digit hexadecimal number. All hashes are calculated in parallel. These properties are not available in Directory Lister Standard. This page allows you to decide how the listing will look like. Directory rows - Display directory rows right before files from this directory. File rows - Display file rows right after directory row. Subdirectories - While listing a directory, display its subdirectories together with files. Subdirectories in front of files - Subdirectories will be always listed on the first position, not among other files. Hide empty directories - Do not display directories which have no files. Hide empty parent directories - Do not also display directories which have no files and some of their subdirectories have some files. Surround subdirectories with < > - Put < in front of subdirectory name and > at the end. File count in directory row - Display file count for each directory just after directory name. This information is presented in brackets, except for CSV, where it is in separate column. If you set mask different than '*. *', this number will be counted only from files which match the mask. Subdirectories are not counted and only files in given directory are counted, without subdirectories. Show time in date columns - Display time as part of date columns. End directories with \ - Put a backslash as a last character of each directory. This option only affects directory rows and does not affect subdirectories displayed as part of directory contents. Draw directories tree - This option works for texts, HTML, Excel and CSV listings. For text listings it will draw a directories tree from ASCII characters. For CSV listings this option will put Names into separate columns. For HTML and Excel listings it will indent the name column. From top-checked directory - Display the path starting from the top-most selected directory. Program will find top-directory which is a common parent directory for all selected directories on the same drive. Top-checked is root - Display the path starting from, but without the top-most selected directory as if it was the root directory. Program will find top-directory which is a common parent directory for all selected directories on the same drive. Current directory only - Display only the current directory, without any parent directory part. From distinct top-checked directory - Display the path starting from the top-most selected directory. Top-selected directory is the first directory which has a white checked mark or gray checked mark. Distinct top-checked is root - Display the path starting from, but without the top-most selected directory as if it was the root directory. Top-selected directory is the first directory which has a white checked mark or gray checked mark. Add leading zeros to file number - When 'Number' option is selected on the Standard columns page, adds leading zeros so all numbers have the same width. File number in separate column - When 'Number' option is selected on the Standard columns page, it is printed in a separate column. Extension in separate column - When 'Extension' option is selected on the Standard columns page, it is printed in a separate column. Path in separate column - When 'Path' option is selected on the Standard columns page, it is printed in a separate column. Split path - When 'Path' option is selected on the Standard columns page, and also 'Path in separate column' above then the file or folder path is split into subfolders and each subfolder is printed in a separate column. End path with \ - When 'Path' option is selected on the Standard columns page, and 'Path in separate column' above (but not 'Split path') then a backslash is added at the end of path. Display summary - Display total files, directories and size for the whole listing at the top of it or at the bottom. Column names in header - Display column names in front of files. The disk size and free bytes options can provide wrong results if multiple network shares of one server are listed or a locally mapped disk drive is listed together with other folders in this disk. Program information in header - Display timestamp, program name and version in the header. This option can be disabled in the registered version only. This page allows you to control how the program should behave when looking for file properties and during listing generation. Files treated all together - Treat files as if they were in one directory, that is numbering and sorting is done for all files regardless in which directory they reside. This option is only enabled when Directory rows option is unchecked on Display page. Treat archives as directories - Display .rar and .zip archives contents as if they were normal directories. Treat directory links as directories - Directory junction points and symbolic links to directories are listed as if they were standard directories. Display NTFS compound properties - This will force to read NTFS file system properties for each file. These properties are not included in the file itself, and are only stored for NTFS drives. This option makes the listing very slow! Listing in each directory - Generate listing in each scanned directory under the name taken from 'Listing name:' edit box. Extension is automatically added. WARNING! This file is ALWAYS overwritten so be sure not to choose a name that will delete your own files! Limit recursion level - If you choose 0 for this option then the program will not go into any subdirectory of a selected directory. When you select 1 for this option then the program will go only to subdirectories of a selected directory. When you select 2 for this option the program will enter subdirectories of a selected directory and their subdirectories, but not any further. And so on. Please note this option means the program will not include and deeper level than selected into any statistics. So this option limits both, how deep to look for directories and (since they are not traversed) the display level of subdirectories. Limit display level - This option causes the program to enter all levels of subdirectories of a selected directory (unless the above option is selected), but any level deeper than selected will not be displayed. Group directories: - All files in directories below chosen level are grouped into the parent directory. Count hashes for directories - Generates a hash sum for each directory. This is achieved by counting a hash value from all hash values for the files in a given directory. Before counting this hash value, all files' hash values are sorted so you are able to find out if two directories contain the same files even if they are named differently. Whirlpool, SHA2 or SHA3 hash sums is recommended for doing such comparisons as they provide the most unique hash values. Count lengths for directories - Sums up total media length for all files in a given directory and all sub-directories. They are then displayed in the "Length" column. This page allows you to select format of certain columns and sorting of columns. Date format - Select how the date will look like. Time format - Select how the time will look like. Size display - Display directory and file sizes in Bytes, Kilobytes, Megabytes, Gigabytes or Dynamic - depending on size, in proper measure. Size precision - When you choose 'Size display' other than Bytes this is the number of digits after the decimal point. Thousand separator - Select character used for separate thousands in sizes. Decimal separator - Select character used for separate decimal numbers from integer numbers in sizes. Select the sorting order for files and directories here. If two files or directories are equal when compared using "1st sorting column" then "2nd sorting column" is compared and so on. You can also choose descending option for each selection. When either "Draw directories tree" or "Windows Explorer mode" option is selected, directories are only sorted within their parent directories. This page allows you to select output type of a listing. Text file - Generate plain text file. HTML file - Generate HTML file. CSV file - Generate CSV file. This option is not available in Standard edition. Database - Stream all data directly into a specified database. See database output for more information. This option is only available in Enterprise edition. Microsoft Excel - Generate Excel file in Open format (XLSX). This option is not available in Standard edition. Encoding - Select whether output file should be saved in Unicode format or ANSI format. Usually you don't need to change this option as the UTF-8 format is the best choice. Auto column widths - Automatically count column widths based on the longest string in that column. This option works for Text and Excel outputs. Wrap columns - When column widths are fixed and a column string exceeds given width, it will be wrapped to the next (and more) lines. Separator - A character used for separating columns in CSV file. If separator is present in a particular column then this column is surrounded with double quotation marks ("). Tab - Use Tab character as separator, thus you can open the output file in eg. Excel. Connection string - ODBC connection string used to connect to a database. Please note this string can contain a clear password which is a potential security risk. You can change the string to keep only DSN=Name property which is usually sufficient to connect to a data source. Drop table before creation - a DROP statement is executed before the table is created. If there is no such table then the listing is executed anyway. Do not create table - a table is not created, so must exist at the time of listing generation. Each time the listing is generated by either refresh or save listing buttons new rows are appended to the existing table. Include folder information - adds additional columns: FolderId (NULL for files), ParentFolderId (NULL for top level folder), FolderLevel. See database output for more information. This page allows you to select HTML options. Generate links to files - Generate links to actual files. Normally, path is copied into HREF part of a tag, except for Path: From top-checked directory and Top-checked is root options. In these cases HREF part does not contain leading '\' char, so you can browse sub-folders when copied to appropriate directory. Generate links to directories - Generate links to actual directories. The same rule takes effect as for files. Put file:// into links - Insert "file://" into HTML <a> tag. This is for browsing local files in Opera and Firefox browsers. Links to subdirectories inside listing - Create links to the place in the current listing where a particular subdirectory contents are listed. Link pattern - You can wrap each link with additional text. Eg. http://www.krksoft.com/my_page/<LINK> will provide links directly to a web page. Change also the Path option accordingly on the Display page. Windows Explorer mode - Create a web page with a folder tree on the left and files listed for each selected folder on the right as in Windows Explorer. Lock table header - Keep the HTML table header at the top of the page after the page is scrolled down so column names are always visible. Include external CSS - You can provide your custom CSS file that will be included just after default CSS definitions within the <style> HTML tag. Specify only the styles themselves, without any HTML tags. You can also paste your style directly into this edit box, limited to 16384 characters. Element - Choose a HTML element here for which you can change Font, Color and Size. Rendering time is much faster than Internet Explorer. Memory consumption is much lower than Internet Explorer. When printing some listings, the second page is printed twice. The first time it is printed without the top row of the second page. Copying of whole HTML without selecting it is not working. Wrapping of the Name column is sometimes different than Internet Explorer. In some display scenarios, table border is not collapsed properly. For very large listings, rendering time is still long and the application might appear to be frozen. Clicking on some files freezes the application. This page allows you to select order of columns in a listing. Select order of columns from left to right. Also when you select a column you can set its alignment to the left or right side of space determined by column width. This only works for text listings. Only files which match the mask from Include files option and which don't match the mask from Exclude files option will be listed. This mask has no influence on processed directories. It concerns files only. You can specify multiple masks separating them with ';' e.g: '*.avi;*.txt'. Wildcards ('*?') are allowed. Another example: Files having no extension: *.? * in the Exclude files option. List only files that were created / last written / last accessed after or before given date or files older / newer then specified amount of seconds, days, months, years. List only files that are between the specified size. All options on this page work as "Display" filters meaning all directories are traversed and stored in the internal database and just not displayed in the listing if they don't match any filter from this page. Only directories which match the mask from Include directories option and which don't match the mask from Exclude directories option will be listed. You can specify multiple masks separating them with ';' e.g: '*.avi;*.txt'. Wildcards ('*?') are allowed. List only directories that were created / last written / last accessed after or before given date or directories older / newer then specified amount of seconds, days, months, years. List only directories that are between the specified size or total size. List only directories that have the specified number of files. Remember directories selection - This will save 'DirListerPro.dls' containing current selection on exit and load this selection file when you start Directory Lister next time. This file is located in "%APPDATA%\KRKsoft\Directory Lister Pro" directory. Save configuration on exit - Silently saves the currently loaded configuration on application exit. This could be the default "DirListerPro.ini" configuration when no other one is loaded. 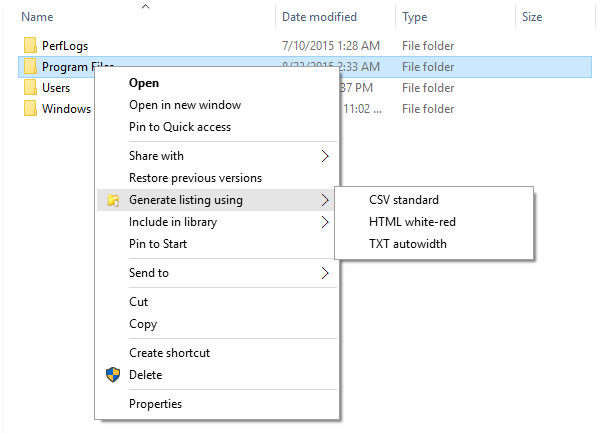 Enable shell integration - This option allows you to start Directory Lister from a context menu interface in Windows Explorer. Automatically refresh preview - Refresh preview window on each option change and directory selection change. Automatically check for updates - Every 30 days program will check if a new version is available and will display a window allowing you to download the latest version. Enable tool tips - Enable tool tips which are shown after you hold a mouse for a while over an option. Limit HTML preview - Enabling this option will cause the preview window to show only the first 10 000 rows for a HTML listing. This is a performance and stability precaution. Displaying more rows in the preview window can cause long program freeze and possibly a crash. To obtain full listing please use the File->Save listing... menu or the Save listing... button from the toolbar. Use customized folder icons - Display customized icons in the directories tree. Enabling this option slightly decreases refreshing the tree structure, but it is easier to find specified folders. Use MediaInfo - Will use MediaInfo library to retrieve metadata from multimedia files instead of the default Directory Lister parser. MediaInfo can provide better results for various file formats at the cost of longer execution time. Sometimes Directory Lister parser provides better results though. User can save the options into a text file called configuration file. This file has .dlc extension. This file contains the states of all configurable options from the user interface, selected interface language and application window position and state. Do not edit this file directly. HTML style files contain a subset of all configuration options only responsible for storing HTML properties. It is convenient when only a visual view of a listing must be changed, without impacting any other option. You can save the names of directories you've selected in the select directories window into a text file called selection file. This file has .dls extension. Only top-most directories checked with 'checked white box' and all directories checked with 'checked gray box' are saved to a selection file. Subdirectories are read during generation of a listing. (...) Other program information: context menu, command line usage, shortcuts, supported extensions and database output are described below. Directory Lister installs itself in the shell context-menu by default. You can right click on any folder or select a group of folders and then right click in Windows Explorer or Total Commander and choose Generate listing using option from the context-menu. Then choose the configuration file you want to use to generate listing of selected directories. After choosing configuration file, user is asked for output file name. You can install/uninstall Directory Lister from the context menu using Enable shell integration option on Program Options page. This parameter causes Directory Lister to read the given selection file , generate a listing into the given output file and close. If extension of selection file name is not specified, then it is automatically appended to the end of the file name. If the first parameter is a directory then this directory will be listed. If extension of output file name is not specified, then appropriate extension is automatically appended to the end of the file name based on the selected output in Output type page. If output file name is not specified then Directory Lister will ask user for it by displaying Save as... dialog. For database output the second parameter is optional. If it is present then it overwrites the "Table name" option on the Output type page. ATTENTION! If any path contains spaces it must be enclosed in double quotes eg. "c:\Program Files\Directory Lister\DirListerPro.exe"
This parameter allows to read given selection file, generate a listing and send it as an e-mail attachment. This option is mutually exclusive with /l option. Optionally recipient and subject can be provided. This parameter allows to read specified configuration file upon start. If extension is not specified then it is appended to the end of file name. This parameter allows to delete selection file specified with /l parameter. Use this parameter with caution as it is primarily intended for use with shell context menu integration. Override configuration option. Note, if the value contains spaces then the whole argument must be quoted, eg. /c "1557=filter me.png". Please check the "reference.ini" file in program folder for mapping between option key and option name. "C:\Program Files\Directory Lister Pro\DirListerPro.exe" /l "c:\my documents\ftpdirs.dls" "c:\ftp\file_listing.html" /o "c:\my documents\myconf1.dlc"
"C:\Program Files\Directory Lister Pro\DirListerPro.exe" /l "c:\my documents" "c:\ftp\file_listing.html" /o "c:\my documents\myconf1.dlc"
"c:\Program Files (x86)\Directory Lister Pro\DirListerPro.exe" /l "c:\my documents\myfiles.dls" /o "c:\my documents\myconf1.dlc"
"c:\Program Files (x86)\Directory Lister Pro\DirListerPro.exe" /l "c:\my documents\myfiles.dls" "MyTable_%Y_%m_%d" /o "c:\my documents\myconf1.dlc"
Directory Lister can stream the listing to a database. This option is useful for huge listings (more than 500 000 files) because the Text and HTML files can hardly display such data. Database connection is made through ODBC interface which must be configured on a PC running Directory Lister. Previous versions of these databases might work but have not been tested. Other databases might also work but have not been tested. Support for other databases might be added in future versions of Directory Lister per request. In database mode the Preview window is used to display diagnostic information about the connection and table created. In order to create a table you need to first select an ODBC connection and then either press the Refresh button on the toolbar or the Save button. Please note Refresh button might create only a limited number of rows depending on the 'Limit HTML preview' option in the Program options page. ODBC connection can be limited to only specify a Data Source Name property (eg. "DSN=My Connection") if such data source is configured on the host. Alternatively it can specify the full set of properties necessary to connect to a database when a data source connection is not permanently configured on a host (eg. "UID=John;Trusted_Connection=Yes;WSID=HOST-PC;DATABASE=mydb"). Please note the ODBC connection string can contain a plain text password which is a security risk. Connection string is stored unencrypted in Directory Lister configuration file. By default Unicode is supported if only it is enabled in ODBC connection settings. For Microsoft SQL Server all text columns use NVARCHAR and not VARCHAR data type. Format options are not respected since date is stored in database native format. Size is always expressed in bytes. Frequency is specified in Hz (not in kHz), media length is specified in milliseconds (not in seconds), FPS is specified in hundreds (eg. 2500 means 25,00 FPS).